Large-cap consumer products stocks have seen an unusual plunge down to multi-year lows. What gives? Broad markets so far this year have been relatively choppy, particularly since late January peaks. But that hasn’t been the case for large-cap consumer stocks. Those stocks have been in a steady downtrend particularly over the last few months. A few headline earnings misses and guidance cuts have hurt the group, but there’s much more going on. Investor sentiment clearly has turned negative and shows no sign of reversing. Indeed, several of the largest and best-known consumer stocks in the world are trading at or near multi-year lows. Most have dropped at least 15% — a huge decline for stocks that are generally docile. From here, the declines not only appear logical but overdue. Challenges in the consumer products space are very real. However, investors chased seemingly safe dividends while ignoring those challenges. With Treasury yields back above 3%, those dividends aren’t nearly as attractive. Without it, the consumer sector has much less to offer. Long-term, the key question is whether the sector can be fixed. I don’t think that’s the case for a number of reasons. The huge move in consumer stocks this year isn’t an unwarranted selloff or a cyclical swing. It’s a sign that the market finally understands how difficult the long-term outlook for the industry really is. Running a screen for consumer stocks and excluding so-called ‘durable goods’ (automobiles, appliances, furniture and the like) and apparel shows just how difficult 2018 has been for large consumer-facing companies. The two classes of Unilever NV (ADR) ADR (NYSE:UL, NYSE:UN) each are up less than 1%. McCormick & Co/SH SH NV (NYSE:MKC, NYSE:MKC.V) has gained less than 2%. The best-performing consumer packaged goods stocks this year are up 1% to 2%. Elsewhere, the news ranges from bad to disastrous. Eighteen of the 25 stocks are down more than 10% this year. Ten have declined more than 20%. On average, these 25 stocks are down about 16% YTD. And this group is comprised of some of the best-known brands in the entire consumer world. In soda, PepsiCo, Inc. (NYSE:PEP) is down 19% and The Coca-Cola Co (NYSE:KO) 8%. The three major tobacco stocks — British American Tobacco PLC (ADR) (NYSE:BTI), Philip Morris International Inc. (NYSE:PM) and Altria Group Inc (NYSE:MO) — have fallen more than 20%. In packaged goods, Procter & Gamble Co (NYSE:PG), Clorox Co (NYSE:CLX) and Colgate-Palmolive Company (NYSE:CL) have dropped 20%, 21% and 18%, respectively. Campbell Soup Company (NYSE:CPB) made headlines on Friday after a Q1 miss and the abrupt retirement of its CEO. CPB plunged 12% on the day and is down 29% so far this year. But General Mills, Inc. (NYSE:GIS) actually has performed worse — and Kraft Heinz Co (NASDAQ:KHC), off 27% in 2018, is right behind it. These are simply enormous moves in less than a five-month period for what are titans of American consumer industry. A number of those companies see their stocks at multi-year lows. GIS is at a five-year low. KHC is just off its weakest level seen since it was created by the 2015 Kraft-Heinz merger. PG hasn’t been below $75 since 2015. CPB hasn’t reached $34 since 2012. All told, the sector has been rocked by huge moves, almost across the board. What’s more, these are moves that really shouldn’t be happening — especially not in this type of market! The declines seen so far this year are highly unusual for a number of reasons. First, these large-cap consumer-facing stocks shouldn’t be that volatile. Of the 25, only BTI has a beta above 1 – meaning the 24 other stocks move less than the average stock. That makes intuitive sense. These are large companies with well-known brands. Consumers — no matter the economy — have to buy toothpaste, food and laundry detergent. And growth is relatively muted, which should make modeling future profits more accurate, limiting volatility relative to a high-flyer tech play like Shopify Inc (NYSE:SHOP) or a biotech stock whose potential success is unknown. Secondly, the broad market actually is up so far this year. The S&P 500 Index has risen 1.5% year-to-date. That’s not exactly torrid growth, to be sure. And volatility in the market as a whole has risen in the past few months while the index still is below late-January peaks. Still, it’s unusual that consumer goods and staples would diverge so dramatically from the industry as a whole. The third and most surprising aspect of the declines is that in the more volatile market environment seen of late, these large consumer stocks generally benefit. PG, CL, MO and Anheuser Busch InBev NV (ADR) (NYSE:BUD) all are classically defensive stocks. When investors get nervous, they usually run to this sector to protect their capital. Indeed, as Bloomberg pointed out last month, that’s exactly what is happening in emerging markets right now. But it’s not happening here. Instead, these stocks are seeing massive declines. Most stocks on this list dropped at most 40% from 2007 peaks to 2009 lows. That was during a (hopefully) once-in-a-generation market crash in which broad markets fell by more than half. We’ve seen – again, in less than five months – an overall decline nearing half that plunge when the market as a whole has risen, if modestly so. What’s interesting is that it’s not as if recent results have driven the weakness in the sector. There have been a few headline-grabbing earnings reports. Campbell’s ugly Friday sent the food supplier space lower. General Mills sank 6% after disappointing guidance back in February. PM saw its largest one-day decline ever after Q1 earnings last month. Still, the results haven’t been uniformly bad. In fact, a survey of 21 of the companies (excluding four domiciled overseas) shows that in the most recent quarter, 17 beat earnings estimates in the most recent quarter. Earnings expectations don’t appear to have changed all that much, either … or at least not enough to support the decline. Forward estimates for Kellogg Company (NYSE:K) and KO stock, among others, actually have risen. At Kraft Heinz, out-year EPS estimates have dropped 5% — the stock is off 27%. Per-share earnings estimates for 2019 for Hershey Co (NYSE:HSY) have come down 2% and HSY has declined 19%. Again, there has been some bad news among bellwethers in the consumer products space. But the emphasis is on ‘some’. PepsiCo beat estimates on the top and bottom lines in each of its last two quarters. It’s down 19% YTD. Procter & Gamble’s outlook disappointed, but its last two quarters were ahead of the Street. As far as earnings go, they simply haven’t been that bad. There’s been some help from tax reform – but given that most of these companies have substantial operations overseas, the benefits have been lower than, say, in the retail space. That aside, performance has been at least in the same ballpark as expectations, save for a few exceptions. At the least, it’s clear that near-term earnings aren’t the major driver. So Why Have Consumer Stocks Plunged? What’s happened, instead, is that earnings multiples have shrunk. For KHC, for instance, investors were willing to pay over 18x FY19 estimates at the beginning of the year. That multiple is down to under 15x — even accounting for a modest decline in consensus estimates. For PG, the forward multiple has shrunk from 20x+ to 16x-plus. Similar moves can be seen across the consumer space. There’s one likely explanation for the shrinkage: Treasury yields. The move of the 10-year back to 3% has been cited as a potential driver of some of the equity market nervousness of late. And for this generally high-dividend space, it’s likely that one factor is income investors leaving ‘safe’ stocks yielding 3% to 4% for even safer Treasuries. And so it seems little coincidence that these high-yielding defensive stocks have turned south just as Treasury yields have spiked. With those yields now above 3%, investor attention has turned from dividends to earnings. And that’s not a good thing given the pressures on those earnings of late. But there’s likely more going on here than just dividends. Expanding the group to low- or no-dividend stocks still shows a fair amount of weakness. Tyson Foods, Inc. (NYSE:TSN) is off 16%, Monster Energy Beverage Corp (NASDAQ:MNST) 22% and Church & Dwight Co., Inc. (NYSE:CHD) 8%. The industry itself is facing significant concerns. Grocers like Kroger Co (NYSE:KR) have declined since last year, when Amazon.com, Inc. (NASDAQ:AMZN) acquired Whole Foods. But that wasn’t the first downside catalyst: it was a Kroger guidance cut the day before the Whole Foods deal was announced that first sent the sector tumbling. Deflation and intense competition have meant grocers are competing intensely on price and facing substantial margin pressure in the process. The concerns in that space likely are making their way to key suppliers like P&G, Colgate and food companies across the board. To offset that pricing pressure, grocers are looking more toward more profitable private-label options. So are Amazon and Walmart Inc (NYSE:WMT). Meanwhile, the core middle-class base that has driven great American brands like Kraft, Heinz, P&G’s Tide, Bounty and Crest, and Colgate is eroding. All the way back in 2011, the Wall Street Journal highlighted the so-called “hourglass effect,” in which brands had to move either up — to higher-end, higher-priced and higher-margin goods — or down — to compete on price, often through dollar store operators like Dollar General Corp. (NYSE:DG) or Dollar Tree, Inc. (NASDAQ:DLTR). But it’s starting to look like branded CPG players are seeing pressure on both fronts. On the high end, there simply are many, many options than ever before. That’s proven by a single trip to pretty much any grocery store in the country. There are myriad organic options in food and cleaners. Between cloud-based IT options and online advertising, the core advantage of big consumer companies (scale) steadily is being undercut. Small manufacturers across categories can compete now in a way that simply wasn’t possible before. P&G is an interesting example. The company’s Grooming segment (acquired through its blockbuster takeout of Gillette back in 2005) long has been the company’s highest-margin business. But profit has declined 14% this year – on top of a 14% decline over the past two years. The company had to cut pricing last year amid the rise of online offerings like Harry’s and Dollar Shave Club. Unilever responded by paying $1 billion to buy Dollar Shave Club in late 2016. Similar competitive problems are being seen across the space. Campbell’s “Simple Meals and Beverages” space has seen organic sales fall 4% through the first three quarters of fiscal 2018. Diet Coke sales have fallen 5 percent in each of the last two years, driven in part by the shift toward alternatives like National Beverage Corp. (NASDAQ:FIZZ) flagship product LaCroix. Anheuser-Busch sales in North America are down (albeit very modestly) over the past two years. The core investment thesis for these types of stocks (and why they have generally outperformed the market over time) was because their brands were so powerful. It’s why Warren Buffett’s Berkshire Hathaway Inc. (NYSE:BRK.A,BRK.B) has happily owned Coca-Cola stock for three decades. What gave those brands power was scale and the ability to snuff out smaller rivals. Those smaller rivals are having much more success of late. And millennial customers, in particular, appear to prefer smaller, less “corporate” brands, as Dibadj pointed out. P&G, Coca-Cola, Campbell’s, Budweiser and Kellogg are losing market share and pricing power. The recent moves in the space seem to show that the market is realizing that problem. The problem is that moving lower doesn’t necessarily solve any problems either. Kimberly-Clark is making diapers for Amazon – a way to maintain share, but at lower margins. McCormick – though it’s managed the pressure so far – has seen its retail partners prefer private label brands. As a result, the company has spent up on brand marketing – to keep those sales intact – while aggressively managing costs to protect against the margin pressure in private label. Margins aside, it’s simply not an easy business in which to operate. Conagra Brands Inc (NYSE:CAG) sold its private label business for $2.7 billion in 2015 – three years after spending $5 billion to enter it. And the problem is that costs are starting to rise. Corn (a huge input given the ubiquity of corn syrup in food – and corn derivatives in packaging) is at a 2-year high. Oil is rising – which raises freight costs. But retailers across the board generally can’t raise costs – and if they can, they’d prefer to restore their own margins first. And so there’s a bit of a perfect storm. Competitors are targeting the high end. There are margin and revenue pressures on the low end. And underneath it all is the fact that being the biggest brand in a space no longer is a good thing – in fact it may be a bad thing. The question with so many large-cap consumer plays at multi-year lows is to the extent that the current pressures may abate. And there are a few reasons to have some optimism at the moment. Firstly, the dollar has weakened. (It actually has strengthened so far this year, according to the DXY index, adding more to the recent pressure. But the bounce in 2018 has come off a three-year low.) That’s a benefit from many of the multinational plays such as PM stock, KO stock and PG stock, who have significant overseas businesses. P&G, in particular, has cited a significant headwind to growth over the past few years, with currency offsetting many of the improvements coming from its transformation efforts (such as shedding its beauty brands in a sale to Coty Inc (NYSE:COTY)). Secondly, the stocks in the space admittedly look much, much cheaper. PG is at 16x forward earnings. CPB is below 11x — a multiple that suggests growth is essentially over for good. MO and GIS aren’t much higher, at ~13x 2019 EPS. Thirdly, there’s the argument that these companies have been through worse. Many of these companies are over a hundred years old. They’ve been through wars, depressions and numerous changes in consumer tastes. Bulls likely will argue that this, too, will pass. Many of the newer brands likely aren’t yet profitable and may eventually fade away. In the meantime, these consumer giants aren’t standing still. General Mills acquired organic food maker Annie’s. Anheuser Busch has purchased several craft brewers and has a 30% stake in Craft Brew Alliance Inc (NASDAQ:BREW). Kraft Heinz is looking to make a deal. PM and Altria are developing cigarette alternatives. The giants may be moving slowly – but that’s not necessarily a surprise. It may take some time, but these companies very well may adapt, as they have so many times before. But I don’t believe the decline is just a temporary and/or cyclical swing. The problems facing the industry are very real and in many cases they are permanent. I just don’t see what these consumer giants can do to respond. All told, there are several reasons why I see the recent re-valuation as a response to a secular shift and not as an overreaction or a simply cyclical selloff. First, the competitive situation for consumer products giants is notably worse. Scale is less of an advantage. Smaller brands can compete more easily. And the shift toward smaller, more unique brands isn’t going away. Consumers are not going to stop drinking craft beer, or eating organic food, or looking for more environmentally-friendly cleaning products. While the biggest companies in the space already are trying to capture those opportunities, they never will be as nimble — or as authentic — as their smaller, nimbler rivals. Secondly, the biggest companies in the space already have made aggressive moves to try and accelerate growth. Few have shown much in the way of success. Coca-Cola has “refranchised” a number of its bottling territories. P&G has sold a number of brands, including Duracell, shut down lower-performing products, and laid off thousands of workers. General Mills bought Blue Buffalo to diversify into pet food. Kraft Heinz has captured billions of dollars’ worth of post-merger cost savings. The largest companies in the consumer space aren’t ignoring the challenges. They’re trying to respond. But it’s not working. Organic growth across the board is rather minimal (often in the range of 1%-2%, if that). It’s true that strong dollar headwinds are abating but that in turn is leading input costs to rise, offsetting much of the benefit. And even with some help over the past few quarters, this still looks like a low-growth industry at best. Third, the long-term trends surrounding the industry aren’t changing. Price competition in grocery isn’t going to stop, particularly as Amazon figures out what to do with both Whole Foods and its Amazon Fresh service. The shift to private label in response has been going on for a couple of decades now. The power of being the largest brand in a space isn’t going to come back. If anything, that power is only going to erode. And international results for brands like P&G, Coke and Budweiser show that the reach of American brands internationally might not be what it used to be. Fourth, consumption trends are changing. Consumers worldwide are trying to drink less soda. They’re trying to consume less tobacco. American children don’t eat Frosted Flakes for breakfast anymore. Processed foods of all kinds are less in demand. Those trends aren’t changing. Consumers aren’t going to rediscover soda. Governments aren’t going to stop pressuring tobacco. It’s very difficult, if not dangerous, to own a company whose demand trends are negative. That’s the case, at least in part, for many of the largest consumer stocks. And, finally, the economy — both in the U.S. and worldwide — is strong. So the obvious question is: if this is what the industry looks like when times are good, what happens when that inevitably changes? Are There Consumer Stocks to Buy? Overall, then, I don’t see the sell-off as creating a huge opportunity. But that doesn’t mean the entire space is all the same … or uninvestable. I made the bull case for J M Smucker Co (NYSE:SJM) last month, in large part because I see that company as navigating away from the industry’s most harmful trends. I’m long McCormick shares since I believe the spices & seasonings category will grow long-term, unlike tobacco, cereal or soda. KHC looks potentially too cheap here (though that’s always a risky argument for a company with substantial debt). TSN and Hormel Foods Corp (NYSE:HRL) could see a bounce if higher feed costs reverse. But the overall move in the sector looks logical. Again, these are massive, well-covered stocks. The declines at PG and CPB and Mondelez International Inc (NASDAQ:MDLZ) aren’t the case of a market not paying attention. They’re the result of the market catching up, catalyzed by the rise in Treasury yields. And they’re the result of investors realizing that the CPG industry is very different than it used to be and not nearly as attractive. The market now only is willing to pay a below-market multiple for consumer stocks — which makes sense! The growth trajectory in the space is much weaker than that of the rest of the market. That’s not a short-term issue. It’s a long-term sea change. It’s a realization that what long has been considered one of the safest industries in the market isn’t nearly as safe as once thought. As of this writing, Vince Martin is long shares of McCormick & Co., and has no positions in any other securities mentioned. 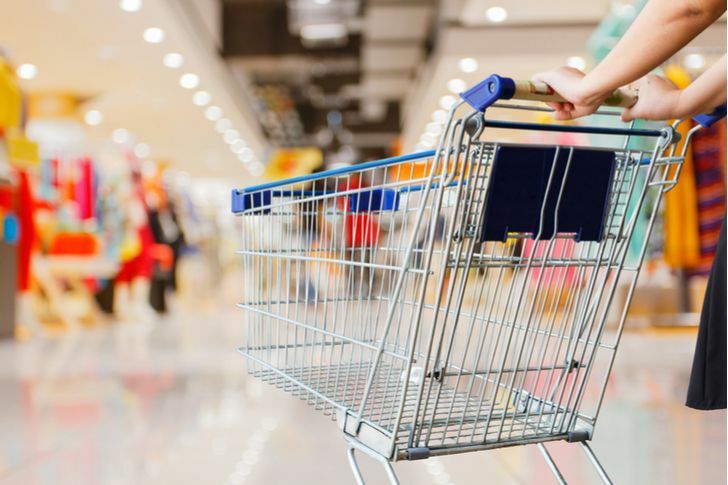 Article printed from InvestorPlace Media, https://investorplace.com/2018/05/are-consumer-products-giants-done-for-good/.